Aldigus, JSC is a modern and professional company, which produce various wheat flour chips and biscuits. A thorough knowledge, plus the use of the latest technology means that we can supply quality Taler chips which respond to current and tomorrow’s needs! A Taler chips or biscuits is not only successful if it tastes good; packaging is also of proven importance to the consumer and to the market. In our business, quality is the first matter of importance, both in our products and in the service we offer to our customers. Here too it is even more important to recognize the partnership between the supplier and consumers. For that reason, Taler constantly communicates with their customers and pays particular attention to what is happening in the market. We distinguish ourselves by: market knowledge, quality/relevant added value, optimal service and excellent business margins. 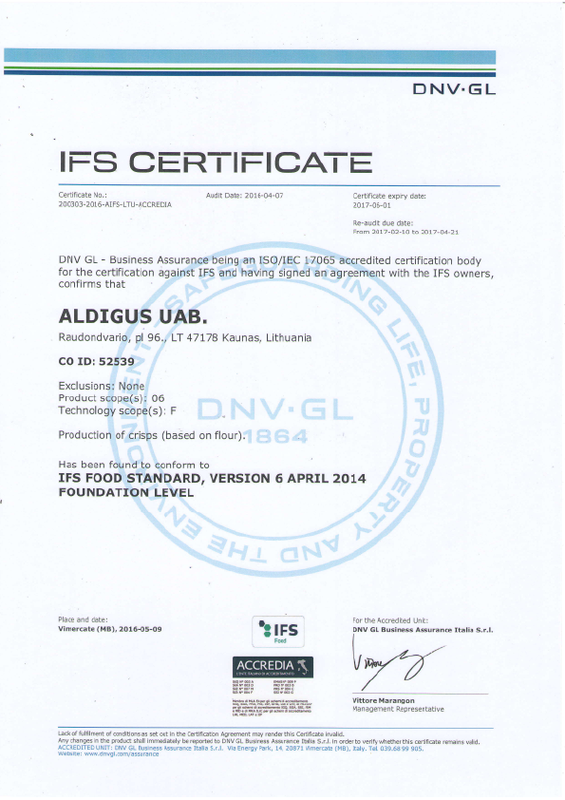 Aldigus, JSC holds certification in IFS highest level.